Adelaide Oval has historically been associated with cricket and football. 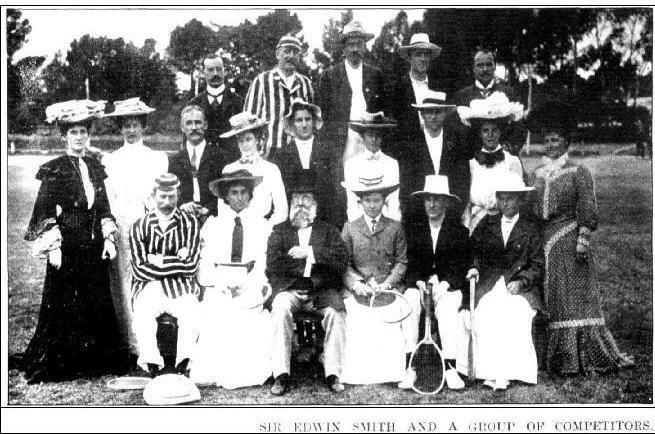 But in the late 19th and early 20th Century, it was also used by Adelaide’s high society for tennis. The Adelaide Lawn Tennis Club, formed in 1878, played matches at the Oval. As a member, Stella regularly joined them. She noted that her father had been an honorary secretary of the club and her mother would visit and have tea. "In Adelaide your social popularity depended pretty exactly upon your proficiency at tennis. Not to play at all was unthinkable – it debarred you from almost all the day-time entertainment that there was. If you were a bad player, you nevertheless tried to run hard and to seem keen, and if you were cheerful, humble, and energetic, you were tolerated. It was necessary to be tolerated, because otherwise what would you do on Wednesdays and Saturdays? Everyone else would be at the Oval where the Adelaide lawn tennis club had sixteen lovely grass courts, and everything was properly done." “Stella Bowen: Lawn Tennis at Adelaide Oval,” Adelaide City Explorer, accessed April 24, 2019, https://adelaidecityexplorer.com.au/items/show/123. Bowen, Stella, Drawn from Life: A Memoir. Sydney: Pan Macmillan Australia Pty Limited, 1999, c.1941.